Fans of this website may remember that I encourage readers to enter the NFL ticket lottery for Super Bowl tickets. It's a great move even if you didn't want to go to the game, because there was a rich aftermarket where these tickets could be resold for $3,000 each. On Monday I got word that the NFL has acted to prevent this ticket resale. I thought I'd update you on the Super Bowl lottery. I've been entering ever since you first posted about it (9 years ago???). This year is the first time that I won! I received an envelope in the mail instead of the usual postcard, saying that I had 14 days to purchase tickets online. There was a special ticketmaster web site set up, and I entered a code to purchase the tickets. This year 2 tickets were $1025. The letter explained that I wouldn't get my tickets until the day of the game at the stadium. I have to show up at the stadium with my ID, credit card that I used to purchase the tickets and some special access passes that I received a few weeks ago. I won't be able to pick up the tickets and leave the secure area or pass off the tickets to someone else (they would need the special access passes to get into the stadium area). We won't know where we are sitting until we receive the tickets on game day. Luckily my husband and I want to go to the Super Bowl - why not it's a once in a lifetime opportunity! And even more lucky - my husband is a huge Patriots fan! So we will be headed to AZ next week for the game. 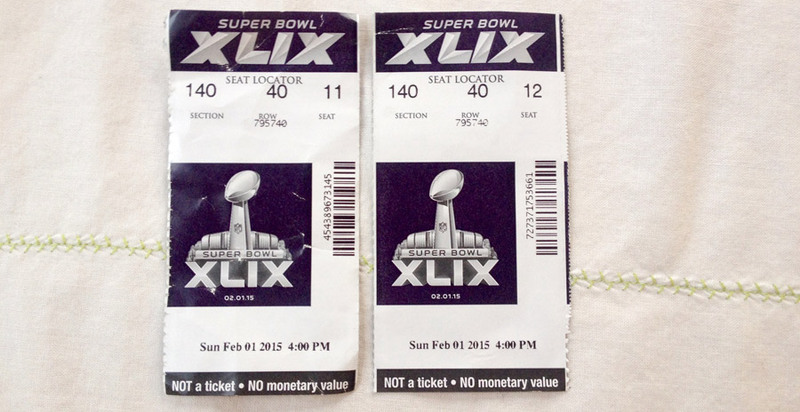 Here are some pics of the passes and tickets we got at the Super Bowl. While we were waiting to get inside the ticketed area we heard people talking about how much they had paid for their tickets. The people behind us had paid $11,000 each and were hoping that they were not fakes! We heard of tickets being purchased for $15,000 each too! There were plenty of people in the parking lot trying to buy tickets but we didn't see anyone selling. We had fun talking hypothetically about what $30,000 in cash looked like and how we would get out of the area without being robbed if we sold our tickets (which there was no way to do). When the gates to the ticketed area opened at noon we were in the front of the line. Security looked at our passes and then we were sent on to the "airport security" area. They searched my (clear plastic) purse, then I went through a metal detector, then they patted me down. Then we were sent to a special person further in who looked at our passes, my ID and ran my credit card. Then our "tickets" printed out of a little machine. We had to go straight into the "Fan Zone" at this point. There would have been no way to backtrack back out to the parking lot if we had wanted to. We hung around the Fan Zone for a few hours - there was lots of entertainment. Then when we went into the stadium they checked our tickets again. At the beginning we could walk all around the concourse of the stadium. As it started to get crowded, we could only walk around in the area where our seats were and the next adjacent area. Our tickets were checked by staff on the concourse and we weren't able to pass if our ticketed section wasn't in that direction. Our seats were good - behind the end zone (south plaza) row 40. There were about 3 rows in front of us filled with lottery winners, in front of that were family members of the teams. It was interesting to see who was around us - Charger Fans, Viking Fans, some guys from Winnipeg.... We heard that 1000 people had won the ticket lottery. Our official tickets will be mailed to us within 3 weeks. It was a great experience, my husband's team won, we screamed and jumped around and were so so so happy. The energy in the stadium was unlike anything I had experienced before and I'm so glad we went! And in case you were wondering, beers were $13 each. The new process must have taken a lot of re-sold tickets out of circulation, forcing the price up! I love the fact that you don't even get your tickets for three more weeks! I think I remember that the used tickets sell for $100 on ebay after the game. I can't get over how you were so lucky! The odds of your favorite team being there, and winning! It's like a 30 to one chance, after you already beat the odds and got tickets in the lottery!